Do you ever wonder what to cook for supper? Despite spending a considerable number of my waking moments thinking about food I do struggle to come up with new recipes to present to my family. Just as I get bored of cooking the same things I’m sure they tire of eating they same old same old. I have never been one for Monday means roast chicken, Tuesday means sausages etc although I’m sure it can make life easier to fall into such a routine. So I made a list of all the things my lot love, took note of what some of them really don’t like (a list whilst not long, is certainly frustrating) and came up with various new ideas. 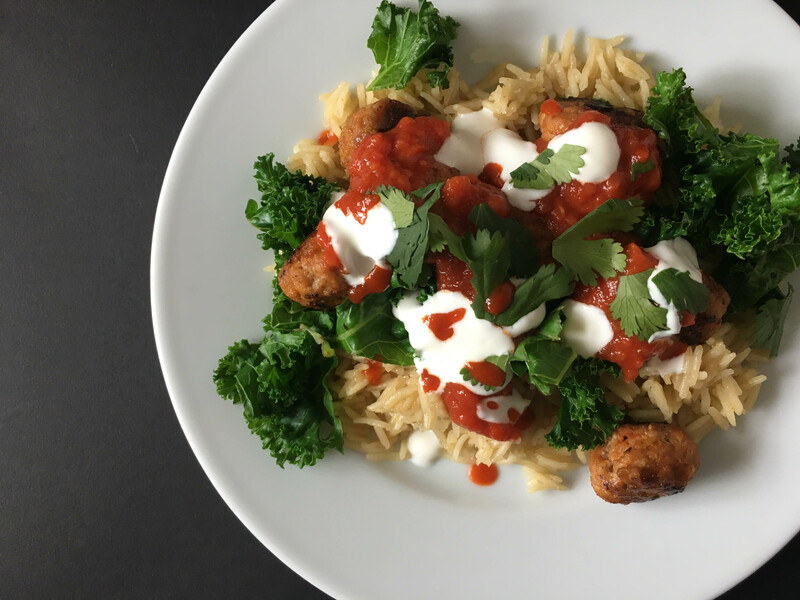 These chorizo meatballs are one such. The whole family love meatballs but I wanted to jazz my usual recipe up and this was the route I took. The spices add a pleasing warmth and the combination of the greens, pilaff and tomato sauce just work really well. Blob a little yogurt and chilli sauce over the whole if you like and some toasted pumpkin or sunflower seeds are another welcome touch. Heat a tablespoon of oil in a pan and gently cook the onion until soft then add the garlic. Stir for a couple of minutes but don’t let the garlic colour, tip it all into a bowl along with the breadcrumbs and milk. Add the mince, both the paprikas and 1/2 a teaspoon of salt and mix well. Divide into small balls approximately the size of a walnut. Add a small amount of oil to a large frying pan and cook the meatballs, turning gently to colour all the sides. Meanwhile for the tomato sauce put the second tablespoon of oil into a small pan with the garlic, heat gently and as soon as it sizzles add the tinned tomatoes, sugar and a good pinch of salt. Let this simmer for twenty minutes. Melt the butter in a saucepan, add the rice, cumin and salt followed by the stock, stir well. Simmer gently for 4 minutes then remove from the heat, put a tea towel under the lid to absorb the steam and leave for a further 20 minutes then fluff up with a fork and check the seasoning. Wash the greens and put into a large pan, cover with a lid and cook gently – the water left from rinsing them will be enough for them to cook in. 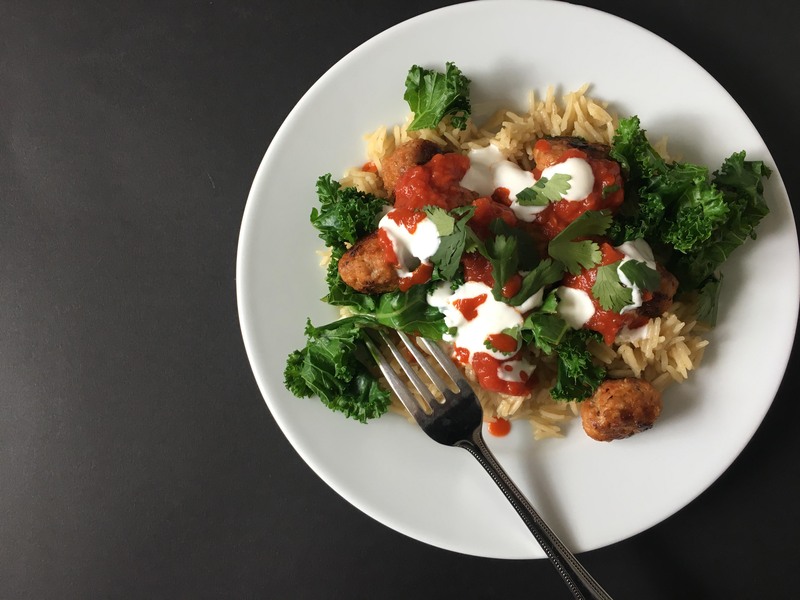 When you are ready to serve tip the rice into a warm bowl, top with the greens followed by the meatballs, then the tomato sauce. Finally sprinkle over some parsley or coriander if using and the yogurt and seeds. Serves 4.